"Working with YWAM in Cambodia, we used GRN's audio materials together with colouring-in books. 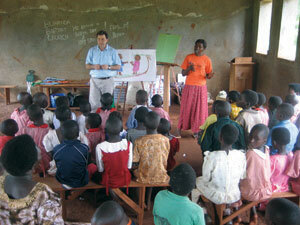 GRN's materials helped the children understand what the story was about as it was in their own language. The moment we turned the audio on the children became very quiet and they loved listening to the stories. It is really useful to have the recordings for the children in their own language, especially for those who don't read." "I started using the GRN picture books about 30 years ago and still use them today in running a kids' club. I find them invaluable as the children just love to look at the pictures. They are a tremendous visual aid when telling the Bible stories." "One day I was visiting a village in the Katchi Kholi language area. As I brought out the hand wind player and played the recordings in their language a young boy, about 10 years of age, just seemed to hang on every word. At the end he asked if he could play the recording. I taught him how to hold and operate the player and he started winding the handle. He played and played and played the recordings. When meal time arrived his parents almost had to wrench the player from his hands in order that he would go and have something to eat. After eating quickly he returned to playing the recordings. When it was time to go to bed the boy had been playing the recordings for about 8 hours. As the machine had an powerful speaker, the whole village was hearing the messages." "On a recording trip in the Solomon Islands one of the language helpers played back a bible story she had just recorded in the local language 'Lengo', so that she could check it for errors. A group of children nearby went silent. The children were fascinated and respectfully came over and listened to the bible story in their language. I realised what a treat this was for them. Lengo is a small language group, and as a result there is not much secular or Christian material written in it. So these children had never learned to read their own language. What a privilege it was to be able to play a part in them hearing the Bible in their own language." 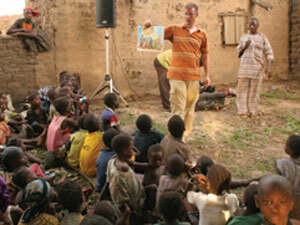 Children to hear the gospel through GRN's recordings and other resources. Those working with children to become aware of GRN's materials. Openness for the children and their parents and families to the good news. God's protection and blessing on children who hear the good news and come to faith in Jesus.